However, one thing I don't find mentioned often (or at all), is how easy/manageable it is for the players at the table to "police" or maintain the integrity of the game in motion. There may be a better term than "policing" since I do not mean "checking for cheaters". What I mean is, at a glance, can a player reasonably look at the table and other players and notice whether someone is making a mistake or handling a mechanic incorrectly. A short example of this would be a game of Poker. A player can easily look up and say, "Hey, you have too many cards!" Thus the integrity of the game is put into check. My observation comes after a couple of play throughs of Scythe. During play, I made a mistake on generating resources because I misheard how the mechanic was handled at the beginning of the game when we did our start of game rules refresher. We played the entire game and no one had challenged me on my resource gathering error. Another example is the player boards. Each player board is different and as players we simply have to trust that each action the other player is taking is being done correctly. Even with 20/20 vision, I simply can't see another player's board upside down across the table and I'm not going to bother having them repeatedly spell out what's on their board. I understand that some of the issues in my example can be alleviated by familiarity with the game and clear player communication. But at a certain point, I find that if a game has information scattered to all four corners of the table there is a high likelihood that a rule will be handled incorrectly and 1-2 hours later you may have a finished game, but likely corrupt. This isn't the end of the world, but I think it is a useful metric when determining the quality of a game. As games get more complex, it will be unlikely that players will be able to "at a glance" check the integrity of the game like in my Poker example, but I definitely think it is something worth striving for in design. Is this a factor that any of you think about when you select a game to bring to the table? Are there any examples of your favorite games that handle this really well? Are there examples of where the game fails in this regard and irritates you? I think it depends on group and game. I gotta say, I would have noticed the mistake in Scythe for sure. However I'm the official unofficial "Rules Guy" of my group, and Scythe is one of my top 5 favorite games. I do basically all the teaching for my group and field more or less all rules questions on our game days. If someone in your group has an encyclopedic library of rules in their head, rule goofs get caught more often. There's another player in my group who probably wouldn't notice if someone deployed all their mechs to the factory at once - he'd just assume it's something in the game. Regardless, it's still good to design for this and I think a lot of it has to do with carefully selecting icons and imagery. Of the games I've played recently, Charterstone does a great job of this, 7 Wonders Duel has good imagery, and for games that are quite a bit more complicated, The Gallerist has really good imagery. For the imagery to be good, the icons have to make sense with very little explanation. This is particularly hard to achieve, because people assume things differently than others (more on this soon). I think playtesting helps with that issue. Then I feel like you have to be meticulously consistent. Symbols shouldn't be reused in unrelated contexts, and it should be abundantly clear when something can NEVER happen (or MUST happen). On the other hand, as another recent example, I just recently learned that in Mansions of Madness... dotted lines CAN NEVER be moved across by players. Quick explanation - MoM has solid white lines on most tiles, and these can be freely moved between. Then there are rarely solid yellow lines and dotted yellow lines. I assumed solid yellow meant no passing, and dotted yellow was just a weird choice but meant you could pass. Then, there are also dotted white lines, which you also cannot cross. Turns out solid yellow can be moved across and dotted lines of ANY color can not be moved across. I have to imagine there is a better solution than this. Personally I think the solid yellow line is more confusing than helpful, and all dotted lines should have been yellow - perhaps solid yellow to just do away with dotted lines altogether. Then there are two kinds of divisions; those you can pass and those you cannot. Oh well, I don't design for FFG. Although not 100%, it is mostly fair to consider it an inverse of complexity. When there are many moving pieces, it is very easy to unintentionally gather more resources, forget an ability, or misinterpret a rule; frequently, no player notices. Some factors that are in addition to complexity are hidden turns and scoring or most situations where one person has hidden information or rules that other players are intended not to see. Evolving games like Legacy and the Fabled series are also prone to errors as the rules change from game to game and players struggle to interpret and then correctly implement the evolving rules. Personally, I've decided to have someone check my math at end of game going forward. I too frequently have miscounted my points. Interesting topic. We aren't discussing cheating, but uncorrected errors. IMHO for any game to function well, someone needs to be aware of the game state for all players. The offset of this is that it means one plyer is always distracted. This. And this is me. I can't help constantly checking the game state for all players, especially when I'm the guy teaching the game. As a consequence, I find myself losing more games when I teach than when I "just" play. I usually explain what I'm doing on my turn during complex games, especially if some players (myself included) are still learning. If I make a mistake, hopefully someone will correct me. It's an "integrity loop," in which all players are helping each other get things right. Hidden dice placement (e.g. Roll for the Galaxy) is probably my least favorite mechanism in a game, as it introduces a weak point in the integrity loop. So right now, I am typically the one that teaches a game. So I guess I hold the "trust" and "integrity" of the game together during each session. It can become exhausting and definitely distracting to teach, play, and then "hold it all together". As game complexity increases so does the potential for errors. One more reason that solo play is best! I don't get how people can play without knowing what everyone is doing. I find games that have simultaneous play tend to be bad for this. In some games, particularly ones with an income phase, everyone at the table is looking at their own tableau to calculate how much money and resources they should get. I remember playing one game with a new player and wondering how she got so much stuff. And so I watched her do her income phase one round and realized that she had misunderstood a rule. It wasn't intentional, but she was still taking too much stuff which was throwing the game off. Generally though, it's too hard to track what other people are doing in that situation and you just end up trusting that they're doing it correctly. I often play games where nobody is aware of the entire gamestate. We survive. Spirit Island, for example, is pretty intense. You are focussed on your own spirit and your own set of problems. You trust that the other players aren't making mistakes. For one player to keep track of everything in a 3 player game would be crazy. I think Tableau style games are representative of the issue of rules "policing". Seasons comes to mind. It's just not practical to stand up, look at another player's pile of cards, and watch them perform their steps. I get the feeling that Tableaus lean heavily into the realm of computer games where the software is the gatekeeper. Still like tableaus, though. Thanks for pointing out Spirit Island. I'm interested in that game for our group as a heavier alternative to Pandemic. I think that game would be a good example of everyone "announcing their moves". 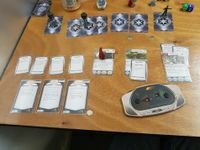 I played as the Imperial player in a campaign of Imperial Assault and it was almost impossible to keep track of what was going on. Every game session had multiple rules queries or people saying 'wait, are you allowed to do that?' and most of them had someone going to an FAQ after the mission to check up on things. We ended up playing multiple rules incorrectly for the entire campaign, only noticing on the last few missions. I think this was a particular problem because of the competitive nature of the game, which meant that players were very motivated to call out things which they perceived as errors as often as possible, and rules lawyer their way through an evening of gaming. If the game was simpler or provided examples for more of the rules and actions then I feel like this would have been less of a problem. I'm very inclined to try out the app for fully co-operative play and see if that makes things any better, but I don't have a group who'd be up for it just now. Harry, it sounds like your group was able to monitor the board state. It's fun when your group is each actively interpreting the rules. Do you feel like there was information that the players were not able to actively monitor? If I am running a game, I do feel 100% responsible for monitoring game state. If I am not running, and I do not understand why someone did something I am not afraid to ask, as a learning thing more than a policing thing. In general, the people I play with are invested in playing correctly and this does not cause friction. The only time I find bothersome is when couples are playing, and the man (have yet to see a woman do this) be all mansplainy. I did get mansplained Dominion by a dude last month who had played 5 games to my 100s. I was a bit off that day, and welcomed correction if I used the wrong term, but my occasional error must have signaled I did not know the rules. (I was not feeling great, and had some cognitive fog from my chronic pain). So I guess I didn't mind being corrected (never do), it was more how it was done. It is hard to put into words exactly what it was, more a sense that he was taking over. I also totally usually lose the games I teach, but they are learning games, and if I win a game I teach, I actually sort of feel bad. I feel I know the game better, so teaching becomes the handicap to level the field. Once I ran a game of Robo Rally and had tremendous luck and won the game while some players were BEHIND their starting position. I don't feel that was a great teaching moment. But damn I played flawlessly! Thanks for talking this through with me, everyone. I'm interested in hearing of other experiences that people have with creating smooth gameplay sessions. What I have gathered here is that there is a particular side-effect present in the person who is "running" or teaching new games. I enjoy teaching games and am always willing to watch a "How to Play" or read the rules beforehand for a new game (whether I own it or not!). However, I was wasn't cognizant of the ongoing experience of being the "head of table" and how this can quite often turn you into a distracted game player (i.e. you're so busy running the game that you're not playing well). This make is evident to me that it might be worth teaching your group and then on your 2nd or 3rd play making a show of handing off the "game czar" hat for that session and say, "Hey, we're playing Dead of Winter. Will you be the person that steps us through each phase and handles the crisis resolution, etc.?" One more reason that solo play is best! Still doesn't help some of us. Each of the other players had a different play area (since they were each playing individual rebel characters) but I think you get the idea. 1) Precise interpretation of rules: in a game where precise rules wording can matter for moving into one tile or another, being in or out of range, etc. etc., it's vital that everyone interprets the rules in the same way. This is difficult, since sometimes the wording is somewhat vague and there are few examples provided. 2) Knowledge of abilities of other players: I was usually sat directly opposite the rebel players, which made it difficult for me to see precisely what abilities or equipment they had. The rebel players could usually see each others' abilities but not mine. Of course we were always happy to pass cards back and forward but it made it difficult for both sides to have a full understanding of the state of the game. Our campaign probably totalled 30-40 hours, and even after that we were still having problems. I recently tried Hive. Bought it as a gift for my nephew who is a student of chess. There definitely is something to say about having all the information readily available.